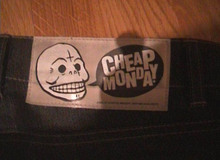 Cheap Monday jeans are selling like hotcakes in various countries, like Sweden. In a recent article, Cheap Monday's logo designer Bjorn Atldax says he's not just trying for an antiestablishment vibe. It seems that by making such broad, sweeping statements, Atlax has a lot of angst - not just against the institutional forms of Christianity, but against the Christian faith in general. Anti-Christian sentiments are certainly nothing new, but do you think that we'll continue to see such philosophical activism increase throughout the consumer marketplace? If not, why not? But if so, what do you envision for the future in this regard? And finally, how should the Christian community respond to all of this? And what SHOULDN'T we do? Ignore, ignore , ignore. Teenagers hate the idea that no one cares. If we stopped giving this so much press in Christian circles, it would just go away on its own. Instead, we're doing just the opposite. Oh well. Jeans that promote something anti - establishment??? I guess???? I don’t know???? Could it work??? Advertising in modernity uses images and slogans - repetitive ditties “you deserve a break today” and of course we all know where that break is. In a lot of ways this foundational question exposes evangelism as “Christianized” advertising. Can “we” compete - counter this with a slogan or marketing scheme of our own? Is this the power of the Gospel? Are the tactics of Christ’s Body a kin to a fencing match, point to point - pun intended? Many of the fads over the years have become comic fodder “WWJD” as I have heard the students in schools I sub in say - “We Want Jack Daniels”, and some other un repeatable sayings. What’s that!!?? Does the slogan response reflect shallow reactionary emotions? The material this rebel call is written upon will become rags and dust. However where is the message of the Kingdom written, if on our hearts, when the rags turn to dust and blow away in the wind our hearts and the life we live as result of changed hearts will still be strong in the winds of “ad” - versity (pun intended). When the protesters and deceived wearers of these jeans are standing “naked” in their whirlwind of ant - establishment deception we will still be standing on the unchanging stable “old ways” Jeremiah 6:16 and will be able to speak about the foundations of our stability Psm.11:3. Rearranging our activities as if some emergency has appeared on the horizon promotes confusion diverting energy away from the long term task of speaking the Gospel to every nation, and who’s goal is that? I forgot after Psm.11:3, clothed in the robes of righteousness given us by Christ. What can be done about it? Probably nothing. Still, I can understand the thought processes that spark things like this. I would suggest that some of the aspects of how such reactions are invited could be worked on, but it would require way too many people to listen that aren't interested in doing so. Look at these small issues even before you look to the wars that have been fought on religious basis and tell me that you don't understand the growing antagonism against the church. I watch even those who are interested getting chased away by the self righteous and it is clear. You can't make this go away. You would first have to write the myriad wrongs done in Jesus' name, and stop them from being repeated. You can't do that, so the antagonism from more and more outsiders is inevitable. DLE, you may be right in advising to "ignore, ignore, ignore". I'm not so sure these things will go away on their own, however. I think we should ignore it. Why are Christians constantly surprized when the 'World' acts like the World? ah, if only the Church acted like the Church! I remember the first time "Jesus" jeans came out ... italian, about 20 years ago. Do you remember those? I think they're still on the market, but, *who cares* and *who wears them*? I agree with DLE, ignore. And with Seraphim, act like a church ... and smile. "DLE, you may be right in advising to 'ignore, ignore, ignore'. I'm not so sure these things will go away on their own, however." Is that what is being done here? While not quite what you were saying, I must counter that in fact many of us are going away on our own. Every day more of the sheep are being lost, or chased away by the wolves that were hired to watch them. Ignoring the problem has never fixed anything. Sure you ignore the petty attempts at instigation. That is smart, but ignoring the root of the problem isn't. Every day more of the sheep are being lost, or chased away by the wolves that were hired to watch them. I must admit to having a hard time how a pair of jeans can be a sheepdevouring wolf ... I'm more afraid of predators posing as sheep or shepherds. Those we have plenty of, some using Christianity as an umbrella, their faith as a cover to do harmful things. Wanderer certainly had a good start on this topic! If we start with Constantine and go forward in time, we find that the more that religion and government get intertwined, the more damage is done in the name of Christ. The Crusades and the Inquisition stand out, but the repeated overt acts of hatred committed by governments against non-Christians stand for me as the loudest, clearest call for a GULF between religion and government. "I must admit to having a hard time how a pair of jeans can be a sheepdevouring wolf ... "
I wasn't referring to the jeans. I was referring to that which I pointed them out as symptomatic of, the comment that the post you quoted suggested was ignored. To reiterate that which I actually said, as opposed to the words you put in my mouth, the jeans are one more example of a reactionary measure, as reaction to the actions of the wolves that divide the church and send many of us out in search of truth elsewhere.